The Seahawk Ladies are off to a 4-1 start (3-1 vs D-I) after an 89-82 road victory over NC Central last night. Our only loss so far was a 95-72 drubbing on the road at the hands of a currently undefeated Ohio U. squad back on Nov 11, with our other wins coming against non D-I Belmont Abbey, Presbyterian College, and Grand Canyon. The combined record of the three D-I teams we beat is 2-10, so we haven't learned a ton about what the team is capable of just yet. Next up is a tough road game against 3-1 VCU on Nov 28. Rutgers transfer shooting guard Shrita Parker has been lighting up the scoreboard with the Hawks, leading the team in scoring with 20.4 points per game. She's shooting .551 from the field and 12-20 (.600) from the perimeter, while also dishing out 3.8 assists and swiping 2.8 steals per game. Another transfer, former ODU Monarch GiGi Smith, is also playing quality ball, and at 5-10 has helped allow the Hawks to roll with a lot of 4-guard lineups. She's second on the team in scoring at 15.2 ppg, shooting .438 from the field, and also has 4.6 rebounds per game. Working her way into the starting lineup, sophomore big Paige Powell is dominating on the glass, averaging 8.6 rebounds per contest while also demonstrating much better offense than she did as a freshman, averaging 8.4 points per game. She's also doing a solid job in rim protection, with 5 blocks in 5 games. Other key returners from last year, Lacey Suggs (8.4 ppg, 3.6 rpg, 3.0 spg), Timber Tate (7.0 ppg, 3.4 rpg .391 3-pt %), Moriah Crisp (3.2 ppg, 3.0 apg, 2.5 A/TO) and Chinyere Bell (6.8 ppg, 3.3 rpg, .733 FG %) are all making solid contributions, though they're being relied on much less than last season. Tate, especially, has seen her role reduced compared to last season, when she started 28 games and averaged 25.4 minutes per game. She's been moved to a role off the bench in the early going, averaging 17.0 minutes per game. With the emergence of new additions Smith and Parker, as well as the contributions of JUCO transfer guard Ahyiona Vason (5.0 ppg, 2.2 apg) and another Rutgers transfer guard Ashli Jeune (1.2 ppg, 10.4 mpg) off the bench, the Seahawks have a much deeper roster than last season. The losses of Jenny DeGraaf, Madison Raque and Rebekah Banks certainly have been felt, but this year's team definitely appears to be better than the 2017-18 squad that finished 12-19 and 4-14 in CAA games. Parker is tied for 36th in the nation in scoring. She's also tied for 74th in FG %. Powell is 7th in the nation in Offensive Rebounds per Game, with 5.6 per contest. Also, if Bell had enough attempts to be eligible, her .733 FG % would rank 4th in the nation. After an 8-day layoff, the Ladies visit VCU tonight at 6. Much like the Men's team's upcoming slate, this will be another tough non-conference test, and begins a stretch where 3 of our next 4 games are tough games on the road (@ VCU, @ UNC, @ Pittsburgh). VCU sits at 4-2 on the season, with their average margin of victory an impressive +12.2. The Rams beat W&M on the road by 17, Longwood by 29, Wake Forest by 13 and Weber State by 28, with their losses coming against 5-2 UNC and a 4-1 IUPUI squad. The Lady Hawks return home on Saturday to start a Women's/Men's doubleheader. They take on non-DI Fayetteville St. at 2 PM before the Men's game with Davidson at 7. VCU was up 9-6 and the Lady Seahawks scored 5 unanswered points to finish the first quarter. 11-9. 16-16 with 6:23 to go in the 2nd quarter. 24-20 VCU at the half. Looks like an ugly game. All things considered, not a bad effort up in Richmond in a 58-47 loss. We had an extremely inefficient shooting night (25.4 % from the field, 15.8 % from 3), with only Suggs (5-11, 1-2 from 3) knocking down with any consistency. But despite this, we still kept the game within reason because we drew fouls and hit our free throws. We were 12-14 from the stripe, led by Parker's 7-8. We also forced 18 VCU turnovers, including 9 team steals, while only giving it away 10 times. And we held the Rams to 3-15 (20 %) shooting from the perimeter. Lot's of good things to like about this team. (11-29-2018 03:16 PM)Seahawk Nation 08 Wrote: All things considered, not a bad effort up in Richmond in a 58-47 loss. We had an extremely inefficient shooting night (25.4 % from the field, 15.8 % from 3), with only Suggs (5-11, 1-2 from 3) knocking down with any consistency. But despite this, we still kept the game within reason because we drew fouls and hit our free throws. We were 12-14 from the stripe, led by Parker's 7-8. To continue my inability to comprehend, I initially read this as “we had an extremely efficient shooting night...” followed by some of the worst efficiency numbers I’ve ever seen. I found a brewery within walking distance of the hotel. Had a few already and about to head back for the freebies. The Lady Seahawks face the Lady Tarheels today at 3:30 prior to the Men's 9 PM showdown. 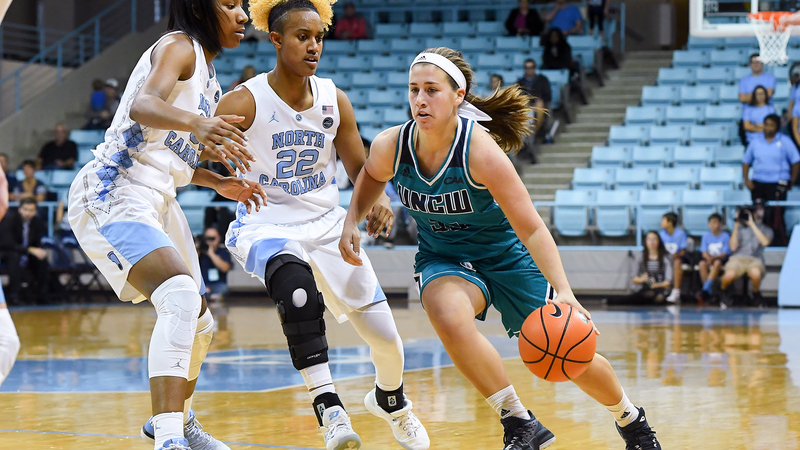 WILMINGTON, North Carolina – Before the UNCW women's basketball team takes a break for fall semester exams, the Seahawks will have one final adjudication on the hardwood when they visit Carmichael Arena on Wednesday for a 3:30 p.m. tilt against the Tar Heels. Wednesday's game can be heard in Wilmington on 95.9 FM The Breeze or online via the Seahawk Digital Network by going to UNCWSports.com/SDN. In addition, live stats will be available at UNCWStats.com. Series Business – North Carolina has won both previous meetings against the Seahawks, including an 86-60 verdict in last year's encounter at Carmichael Arena. Family Reunion – Former UNCW letter winner Bett Shelby is a member of Coach Sylvia Hatchell's staff at North Carolina. Shelby played in 11 games for the Seahawks from 2002-04 before transferring to Greensboro College. Afternoon Delight – Five of the Seahawks' first seven games this season have been afternoon affairs. Road Warrior – Redshirt senior guard Shrita Parker has averaged 25.3 points per game in the Seahawks' three road contests this year, including a career-high 36 points against N.C. Central on Nov. 20. GiGi Smith put up 21 pts and 6 boards. Parker added 14. After a 13-day layoff, the Seahawks head to western PA tomorrow night to face the Pitt Panthers at 7 PM. Pitt is 6-5, and has played a tough schedule to date (# 69 SOS). Their last time out (Dec 8), they got destroyed by West Virginia 77-43, but prior to that had won 4 straight, including Top 100 wins against 8-3 Arkansas and 5-3 Northwestern. The Lady Hawks return home this Friday at 7 PM to host the Longwood Lancers. Longwood is currently 1-6 and # 349 in the RPI. The Seahawk Ladies took Pitt to the limit last night, but fell 60-56. The Hawks had a 13-point lead in the 3rd Quarter, but the Panthers came roaring back and took the lead with 47 seconds left. We narrowly missed out on Coach Barefoot earning her first "signature win". This was a very encouraging effort for the Hawks with CAA play just around the corner. Love a good basketball season sweep of ezu. This was a really nice win heading into league play. ECU was 9-3 entering this game, and had beaten a solid Wake Forest squad earlier in the season. Coach Barefoot is 2-0 against the Pirates. The Lady Hawks open league play against Charleston on Friday for an 11:30 AM contest.